A third of Sky customers polled blamed the government for the breakdown of Brexit, 24% the UK and EU equally, while 26% blamed MPs above all. People reacted in dismay to Theresa May’s short statement outside Downing Street, and many tonight called for Article 50 to be revoked to avoid Britain crashing out of the EU with no deal. In a very short speech repeating how unwilling Theresa May is to change her course despite having lost the backing of MPs, the British public in polls and the patience of EU leaders, the PM insisted that she would still “work night and day” to persuade MPs to vote for the unpopular Withdrawal Deal she has secured. 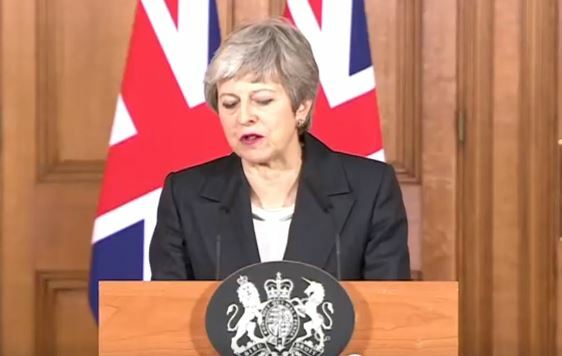 She reiterated what she had said before, that MPs have a “final choice” – do they want to accept the deal, leave with no deal or not leave at all, causing huge damage to public trust? May accused MPs of never deciding want they want, only what they do not want. – Exactly what her EU negotiating partners had said about the Conservative negotiating team. Needless to say people were underwhelmed by the Prime Minister’s stubborn repeating of her catchphrases. Sky News Political Editor Faisal Islam said it was unwise to alienate MPs when May needs them more than ever. Buzzfeed’s European Editor was similarly disappointed. Earlier Donald Tusk said that the EU would accede to the Prime Minister’s request for a delay to Brexit until June 30 if MPs vote for the EU withdrawal bill that has been agreed with the EU. MPs have voted against the deal negotiated by the government twice already, accusing it of being flawed, leaving the UK stuck as an EU rule taker and not rule maker with an indefinite backstop in place to stop Northern Ireland having to leave either Britain or Ireland’s regulatory framework. But MPs’ choices have narrowed tremendously now. They have a choice between voting for Theresa May’s deal, the UK unilaterally revoking Article 50 or crashing out of the EU on March 29 with no deal. “We are still legally due to leave the European Union in nine days’ time,” he said at a fractious PMQs with Theresa May criticised from all sides for not requesting a pause for Bresit long enough to secure a realistic solution. May was heckled with calls to “resign” from the Labour benches as she set out her request for an extension until June 30. Former Attorney General Dominic Grieve today told the Commons he was never more ashamed to be a Conservative MP. Tonight he reacted to Theresa May’s speech, saying that if his party leader failed to persuade MPs to vote for her deal, MPs would have 72 hours to decide whether to crash out of the EU with no deal, revoke Article 50 or hold another public referendum. On Saturday crowds are set to march for a People’s Vote all over the UK in what is set to be one of the country’s biggest ever protests.